Bombardier’s Learjet 75 is a staple in the light business jet category when it comes to impressive passenger comfort and reliability. Since its certification in 2013, the Learjet 75 has been a favorite among pilots and passengers alike. 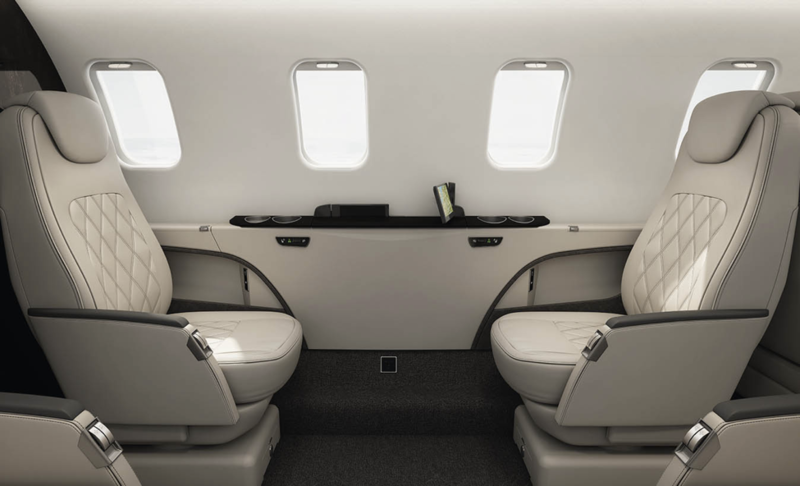 The Learjet 75’s cabin typically seats eight passengers in a double club configuration that is both convenient and practical for business meetings. Each luxury seat has its own personal touch screen monitor that can easily stow away for more room. Built in sidewall speakers and high speed internet also provide the ultimate entertainment and flight experience. Featuring a flat cabin floor, passengers aboard the Learjet 75 can easily move around and access inflight storage for personal items. An innovative and unique pocket door separates the cabin from the cockpit and galley and is the first of its kind within a light jet. The pocket door allows for total privacy and low noise levels on every flight. Additionally, cabin space visually increases with eight windows on each side of the jet as well as a roomy lavatory. 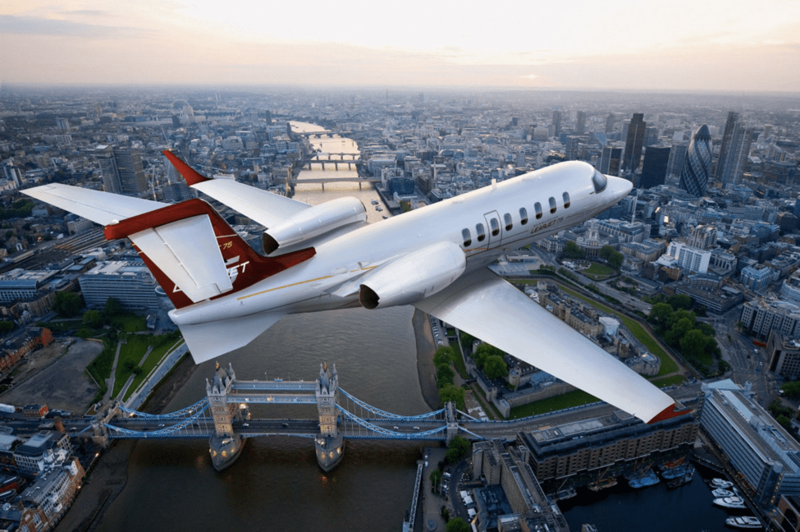 Two new Honeywell engines power the Learjet 75 and add 10% more power to the aircraft, allowing it to fly 2,040 nautical miles and at a maximum altitude of 51,000 feet. The increased thrust also allows the aircraft to takeoff on field lengths less than 4,500 feet. The engines and design of the light jet are not only efficient but produce very low fuel burn as well. In the cockpit, Bombardier’s Vision Flight Deck features three 14-inch displays with split screen image capabilities. 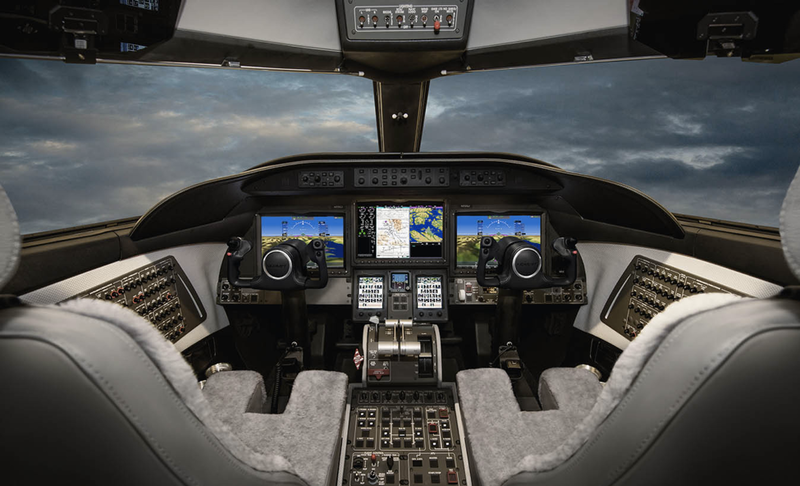 Synthetic vision, graphic flight planning, along with LPV approach navigation and touch screen controllers allow pilots to effortlessly fly the Learjet 75. Maintaining Bombardier’s reputation for speed and performance, the 58-foot-long Learjet 75 constantly provides seamless and private travel. It is priced at about $13.8 million.